Your cart is currently empty! Add items and they'll show up here. Please note that Ecommerce on our site has not officially launched. Product is not available in this quantity. We are in the midst of New York State's only Wilderness Canoe Region. From lakes, waters, and streams to berms and mountain ranges. To New York’s only wilderness canoe region and on the secluded shores of Lake Clear – where Einstein relaxed. Our lake property faces west into the St. Regis Mountain Range offering the most incredible mountain-lake sunsets anywhere in the world filled with the songs of our resident loons, the flight of our neighboring bald eagle and endless hiking trails. Be prepared: the weather changes rapidly in the Adirondacks and you may be going for miles without any amenities i.e. water, food, and bathrooms! Always consult current statewide and site-specific regulations before hiking anywhere. Pay attention to special restrictions. Any questions should be deferred to the New York Department of Environmental Conservation or www.dec.state.ny.us. The immediate area surrounding the Lake Clear Lodge has some of the most diverse hiking experiences anywhere in the world, with great opportunities to experience incredible side trips and to enjoy a whole set of diverse outdoor activities like biking or hiking, to a fishing spot or simply walking, driving or climbing a mountain for incredible views. Some are remote and non-motorized; others are right off the main highways. Experience it all! Cathy and Ernest are foremost innkeepers and not licensed guides, ultimately it is your responsibility to be prepared and knows the rules. Have fun! Interested in assisting us to update this information? We would love to share your information for others! Please contact us! Do not Move! Right from your handcrafted lodging door at the Lake Clear Lodge & Retreat: A biking/hiking Mecca! What follows below are experiences we have undertaken with technical information provided publications. Despite our love for biking/hiking and the fact we have been here for generations, we have only scratched the surface of opportunities available to you. For example, the St. Regis Wilderness area is the largest intact forest east of the Mississippi River with over 50 species of mammals, an estimated 200 species of birds, a reported 86 species of fish and more than 30 tree species grow in the region. The 46 High Peaks with 42 mountains over 4,000 feet stretch over 1,200 sq. miles alone. We have not yet even discussed the historical and sports sites to see of the Olympic region. To do and see so many different things while you hike is truly an unprecedented opportunity in our region. There are numerous mountain hikes within 15 minutes from the Lake Clear Lodge that are simply spectacular with many of them offering an incredible view of the High Peaks and the many, many bodies of water that make up the 18,000 acres St. Regis Wilderness Canoe region and the Saranac chain of lakes. Our family needs to climb this mountain! From the publications listed above, we understand the roundtrip distance to be over 8 mi. that can be done in 5-6 hours. Access is from the Visitor Interpretive Center 7 minutes from our Lodge at the Barnum Brook Trail. The trail does limit the number of passes so it is good to call the Center. From cross-country skiing here many times it appears that the view would be spectacular for its size. We understand the trail does not head directly up due to the north and west sides of the mountain having been burned in 1903 and a fire burned on the east side in 1912 right down to Long and Black ponds. The trail is marked and you can see meadows, ponds and at the top St. Regis Mountain, the High Peaks, and Tupper Lake. While we have not climbed all 46 High Peaks, we have been to enough to know that St. Regis Mountain offers some of the most spectacular views in the Adirondacks. It is the beautiful mountain range that you see from our Lake Clear shores whose silhouette reminds us of an angel lying down! The distance roundtrip is about 6 mi. with a time of about 4 hrs. Access is Rt. 30 at Paul Smiths from the Keese Mills road about 7 minutes from the Lodge. The access road is the former Meriweather Post-camp of Post cereal fame. There are trail markers. It also possesses one of the few remaining fire towers in the Adirondacks. Its summit height is 2873 ft. The mountain stands amidst the Saint Regis Wilderness area and thus surrounded by 58 lakes and ponds. To the north, you can see the foothills of the Adirondacks and the St. Lawrence River Valley and Canada. As you turn east you can see the High Peaks, Whiteface, Upper Saranac Lake, Tupper Lake, and more ponds and lakes and more ponds and lakes. It’s spectacular and good for kids, though the top part of the climb is steep. About 12 minutes from the Lake Clear Lodge the distance roundtrip is 7 mi. with an estimated time of 6 hours. Access is from Meacham Lake State Camp Ground on Route 30 past Paul Smiths so a pass is required. Debar Mountain is one of the northernmost mountains offering views of the Saint Lawrence River Valley and Canada. The climb goes through a wonderful forest and the last half-mile is a fairly steep climb. A fire swept the area in 1908 that consumed over 6,000 acres. At the campsite ask for directions as the trailhead not marked. The elevation of this mountain is 3,320ft. With an elevation of 3860 ft. and a roundtrip distance of nearly 11mi. with an average time of 6 hrs. This long trip makes it difficult for kids though it is not an extremely difficult climb. Access is on Rt. 86 between Saranac Lake and Lake Placid in Ray Brook approximately 15 minutes from the Lake Clear Lodge. 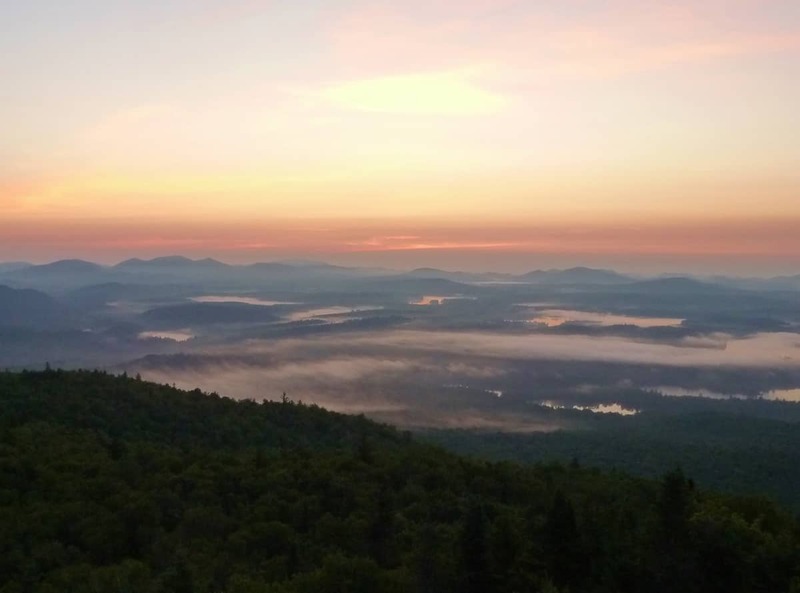 The summit is quite wooded but has nice views of Moose, St. Regis, Whiteface, Ampersand and Scarface Mountains, the Saranac chain of lakes, the Sentinel Range and the High Peaks. It also has nice small waterfalls and several streams. You can also access the trail to Haystack Mountain (blue markers) and the red markers symbol the McKenzie trail. The top of McKenzie has a rare form of mountain wood ferns. A fun climb that is great with kids. Located in Saranac Lake 12 minutes from the Lake Clear Lodge this has a surprising view of the High Peaks and the hamlet of Saranac Lake even though its elevation is only 900 ft. The hike is a 1.8 miles round trip. We have not climbed this mountain in years and in writing this I remind myself that it is time to revisit this beautiful mountain that takes about 4 hours that is good for kids but more challenging. Access is on Rt. 3 near the junction of Rt 30 with a DEC sign. Ascent is 1800ft and the roundtrip is 6 miles. At the top, you feel like the middle of a roundtable of the Adirondack Mountains and lakes. The 3,352 summit is entirely bare offering an incredible view of the High Peaks. The mountain was used for triangular lines by surveyors to other mountains resulting in time with a bare mountain top. Access is on approximately 1.5 mi. past the intersection of Rt. 30 and Rt. 3 about 20 minutes from the Lodge. As a less than 2 mi. roundtrip this is a great beginner climb. 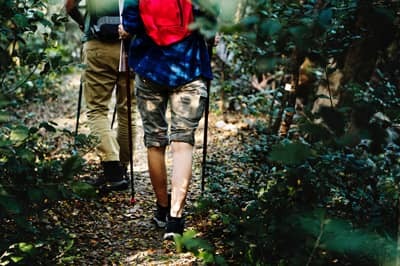 If a more level type of hiking is your style there are excellent trails almost all within 15 minutes of the Lake Clear Lodge. 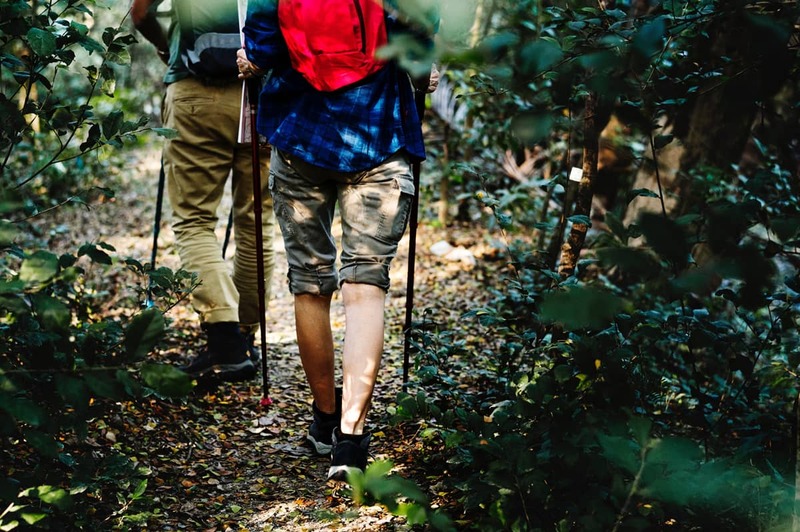 These hiking experiences offer a diverse range of natural wonders from boreal forests to lakes and incredible plant and wildlife seen anywhere in the world. There are only 2 Visitor Interpretive Centers in the Adirondack Park and you can experience one 7 minutes from the Lake Clear Lodge! The Centers are a great way to walk the woods with displays and educational information about what you are seeing. There is also an indoor exhibit. Access is on Rt. 30 in Paul Smiths 5 minutes from the Lodge. A 2.5 mi. loop is as beautiful as it is diverse as it transverses an esker and flows along ponds formed by glaciers. Along the trail is a majestic grove of white pines called the “Cathedral”. There is also a natural beach. The trailhead is in the parking lot opposite the College. Access is off Rt. 30 by Rte. 99 where on the opposite side of the road is the Red Tavern Road. Follow this for approximately 7 mi. to the trailhead. Everton was once an important logging town and yet today little remains. The last logging was in the 1960s and is a good example of forest succession. There is an interpretive trail that will take you through tree club moss – a reported miniature evergreen that millions of years ago grew like trees. It was also important apparently as an ingredient in the powder used in flash photography in the 1800s. I've climbed St. Regis more than any other mountain - probably around 90 times. It's a great choice to hike as its dominates the view from the Lodge beach! All rates and prices are subject to change without notice and do not include any applicable taxes, fees, gratuities or incidentals.